Once all the files finish downloading, we need to make sure our local Python installation is aware that Django exists on our machine. There are a couple ways to go about that, but a symbolic link to your Python site packages directory is probably the easiest. If you’re on Windows, the easiest thing to do is add Django to your PythonPath environment variable. On Windows, you can define environment variables in the Control Panel. Django installation docs suggest creating a symbolic link to the file /home/username/.local/lib/python2.7/site-packages/django/bin/django-admin.py in a directory on your system path, such as /usr/local/bin. Just paste this code in your shell. 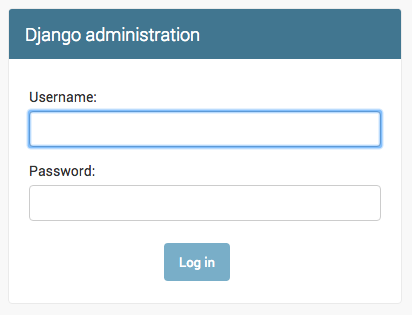 Now that Django is installed and Python knows where it lives, we’re ready to get started. This is going to be our project folder into which we will add various apps. The next step is to fill out our project settings file. Fire up your favorite text editor and open up the settings.py file inside the “ProjectName/ProjectName” directory. There's a lot of different database software that can store data for your site. We'll use the default one, sqlite3. The other settings are well documented in the settings.py file and we can skip over most of them for now. And we're done! Time to start the web server and see if our website is working! The web server will take over your command prompt until you stop it. To stop the web server, switch back to the window in which it's running and pressing CTRL+C - Control and C buttons together (on Windows, you might have to press Ctrl+Break). Congratulations! You've just created your first website and run it using a web server! Instead of hard coding the path to our templates folder this is dynamic — and it showcases how easy it is to tweak Django using Python. We just import the os.path Python module and then find the path to the directory where settings.py is and then appends ‘templates’ to that path. Now when we push the site live, there’s no need to change the settings.py file. In the AppName/models.py file we define all objects called Models - this is a place in which we will define our contents. For Example, if we want to create blog posts, let's open AppName/models.py, remove everything from it and write code like this. Double-check that you use two underscore characters (_) on each side of str. This convention is used frequently in Python and sometimes we also call them "dunder" (short for "double-underscore"). Let’s step through the code line by line and we’ll talk about what’s going on. class ObjectName(models.Model): - this line defines our model (it is an object). class is a special keyword that indicates that we are defining an object. ObjectName is the name of our model. We can give it a different name (but we must avoid special characters and whitespaces). Always start a class name with an uppercase letter. models.Model means that the ObjectName is a Django Model, so Django knows that it should be saved in the database. Django prepared for us a migration file that we have to apply now to our database. Hurray! Our model is now in our database! To add, edit and delete posts we've just modeled, we will use Django admin. As you can see, we import (include) the Object model defined in the previous chapter. 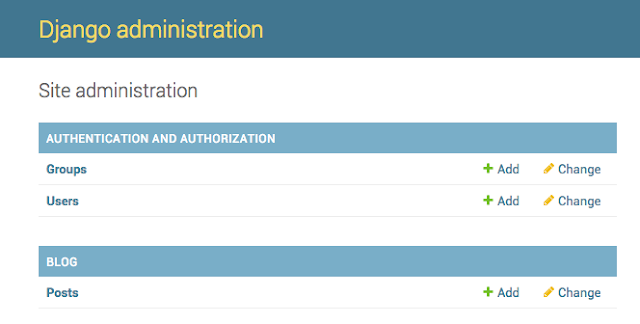 To make our model visible on the admin page, we need to register the model with admin.site.register(ObjectName). To log in, you need to create a superuser - a user which has control over everything on the site. Go back to the command-line and type python manage.py createsuperuser, and press enter. When prompted, type your username (lowercase, no spaces), email address, and password. Return to your browser. Log in with the superuser's credentials you chose; you should see the Django admin dashboard.